March Is roaring in like a lion sending a Nor’easter our way. Although nature appears dormant, the long anticipated Spring will stimulate our senses of sight, smell, sound, touch, and taste. We will be mesmerized again by the kaleidoscope of colors of the plants and flowers and feel the exuberance of the chorus from all the animals and insects. March’s flower, the daffodil symbolizes new beginnings as it is the first Spring flower to bloom following the winter frost. Walt Whitman in his famous poem “I Wandered Lonely as a Cloud” is an ode to the dancing white and yellow six pedal flower daffodil (Narcissus) with its contrasting colored cup or trumpet shaped cornet. After a rare February with no Full Moon, March 2018 will have two full moons again. The first on March 1st known as the Full Worm Moon and second Full moon is March 31st ; a Blue Moon. We spring ahead — Day Light Savings on March 11th, however, Spring officially arrives on March 20th. March is a busy month with March Madness college basketball games, The Orchid Show at the New York Botanical Gardens, Macy’s Flower Show, St. Patrick’s Day Parade on March 17th, David Bowie Exhibit in Brooklyn, Armory Art Show, New York Mets Baseball, and the March for Our Lives on March 24th a movement against gun violence in memory and in honor of the many lives lost. Our thoughts and prayers are with the family’s in hopes of healing and renewal. 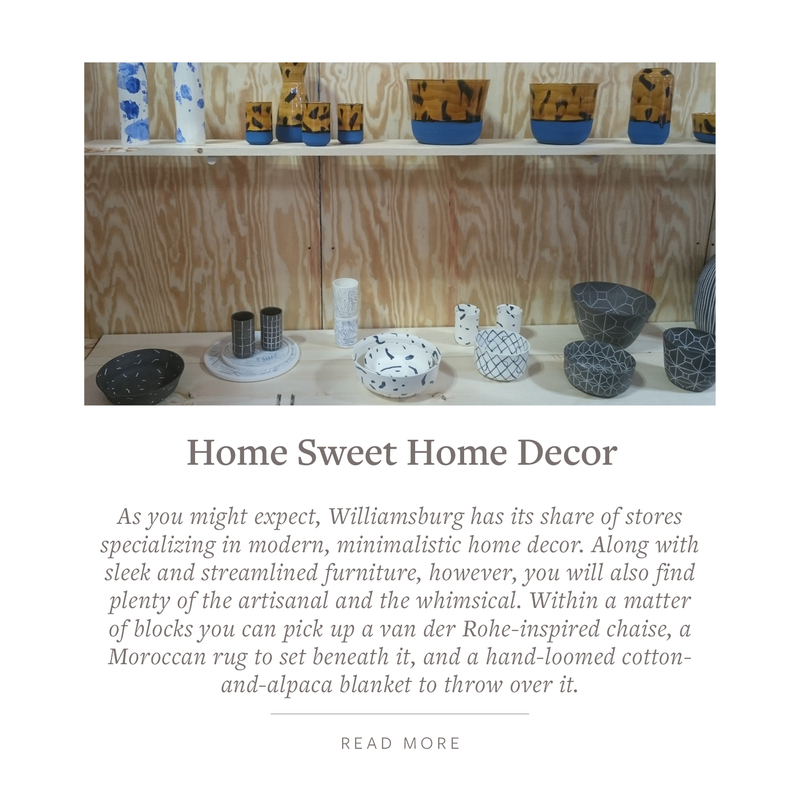 This month’s Culturally Inclined focuses on Williamsburg, a neighborhood known for the famous Williamsburg Bridge and waterfront connecting lower Manhattan to Brooklyn and artistic vibe. Williamsburg is bounded by Greenpoint to the north and Bedford-Stuyvesant to the south; the dividing line between neighboring Bushwick to the southeast is not clear and controversial amongst its residents and becoming even cloudier with the gentrification of the area. This is not the only boundary controversy. 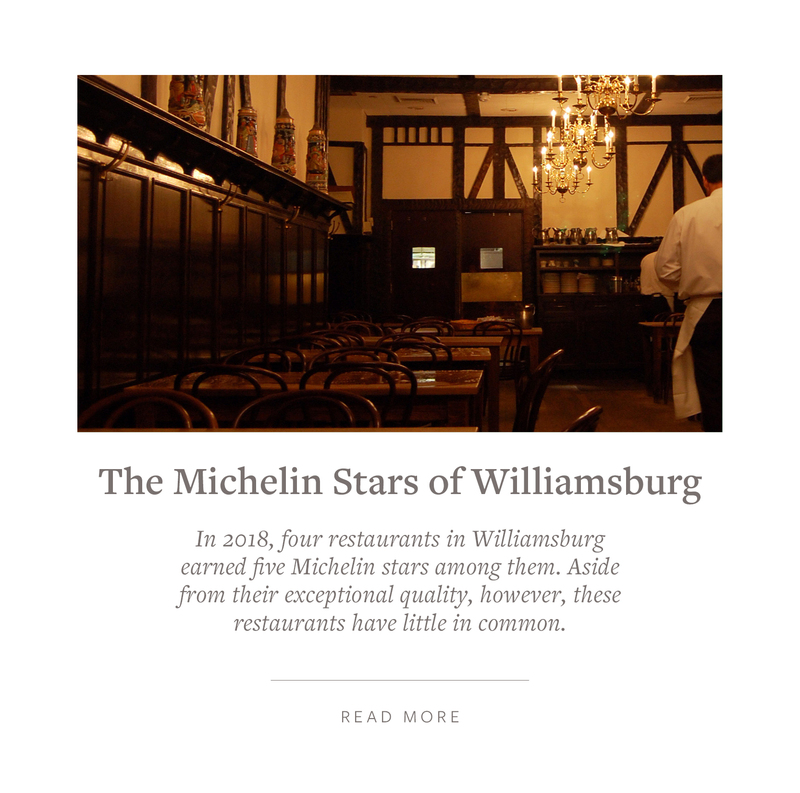 Williamsburg is delineated by trendy North and once upon a time the gritty South, which is rapidly changing. 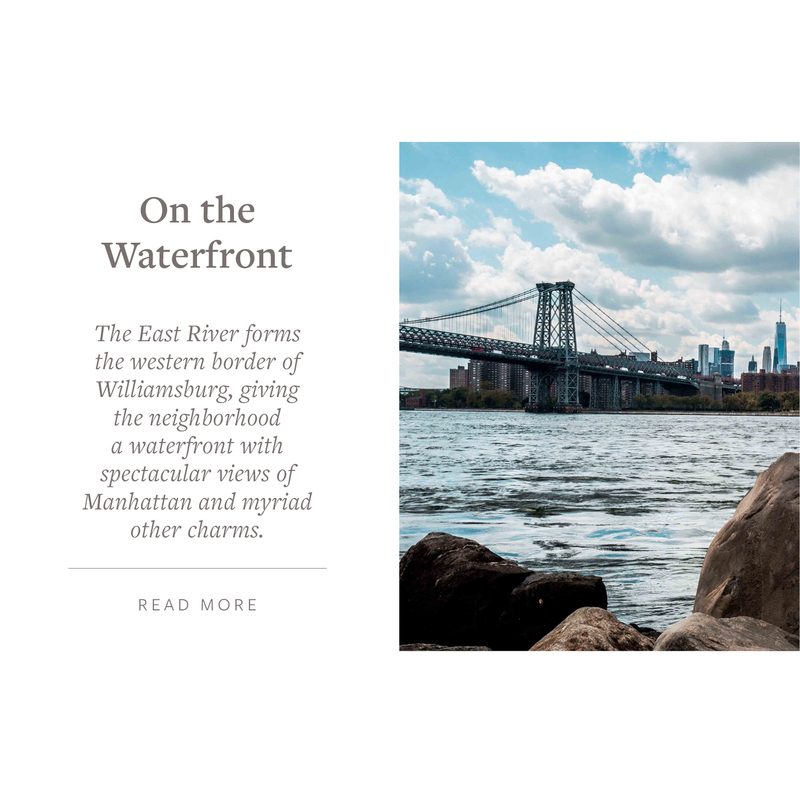 Generally, the northern border of the neighborhood is Grand Street and Union Avenue to the east, East River forms the western edge, but the southern edge is up for grabs is it Flushing Avenue or Division Avenue? There is also East Williamsburg that has its own geographical politics. The easy way to access Williamsburg is via the L train and stop at Bedford Street. The L train running from Eight Avenue and 14th street in Manhattan to Rockaway Parkway in Brooklyn will be shut down for renovation in April 2019 for 15 months. To compensate for the L disruption there will be additional service on the J, M, Z and G subway lines and a new ferry route operating between North Williamsburg and 20th Street/Avenue C (Stuyvesant Cove) in Manhattan running 8 boats per hour in each direction – one every 7.5 minutes. And transfer to the ferries will be integrated with the M14 and M23 SBS routes cross town. 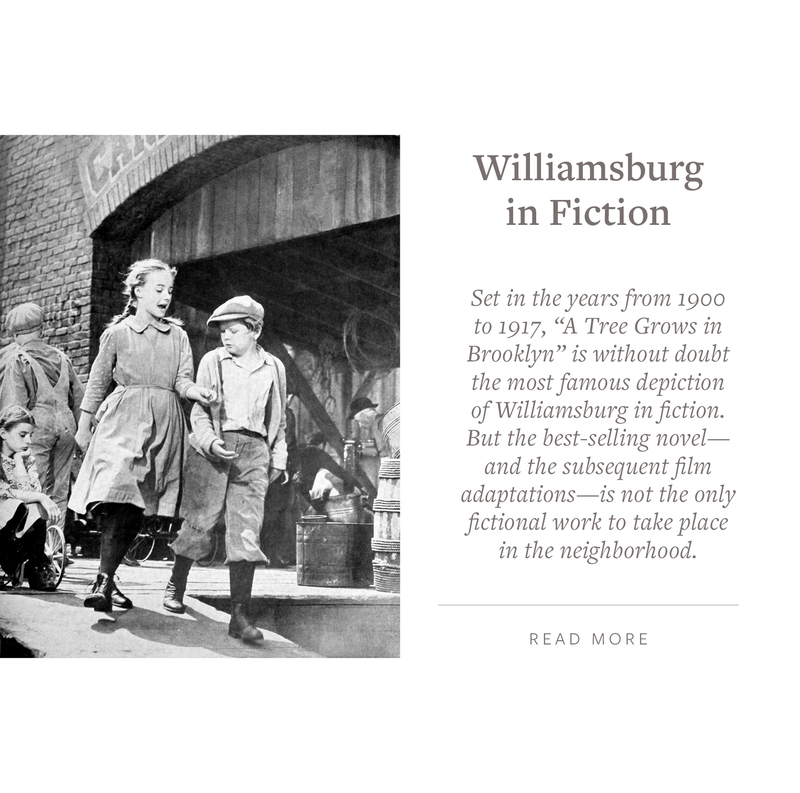 Williamsburg(h) in 1827 was incorporated as a village. During the mid-1800’s the largest industrial firms moved into the area: Pfizer Pharmaceuticals (1849), Astral Oil (later Standard Oil), Brooklyn Flint Glass (later Corning Ware) and the Havemeyer and Elder sugar refinery (later Amstar and Domino), as well and D. Appleton & Company, U.S. publisher of Alice in Wonderland and Charles Darwin’s The Original species, Breweries such as Schaefer, Rheingold and Schlitz, docks, shipyards, refineries, mills and foundries opened along the waterfront. Followed by the Williamsburg Savings Bank, The Williamsburgh dispensary, The Division Avenue ferry and three new churches were established. Williamsburg industrial empire is creatively being repurposed. There is a “Massive New Office Complex on the Rise” new construction at 25 Kent Avenue that will stand eight stories tall to be completed by the end of the year, Two Tree’s is in the process of redevelopment of the second phase of the Domino Sugar Factory, the development of the Dime Savings Bank is expected to be completed in 2019 and a new-22 story tower 177 rental apartment by Charney Construction and Development, Tavros Capital Partners, and 1 Oak Contracting and hired Fogerty Finger to design the new structure. In early 2000’s the Oosten a 216 condo project was marketed for sale. The project was developed by XIN Development and designed by Piet Boon on the site of the former Schaefer beer plant. As reported in Crain’s February 12, 2018 publication titled City Curbs Hotels, Yet Keeps Giving them Tax Breaks “little attention had been given to the city’s 1970’s Industrial and Commercial Abatement program (ICAP), which zeros out property taxes for as long as 15 years and discounts them for up to a decade beyond that.” The trendy Wythe Hotel, William Vale have benefited from this program and the Williamsburgh Hotel is trying to benefit as well and Cornell Realty Management is planning a 26-story residential/hotel project. The example provided was that ICAP wiped out $1.7 million of William Vale’s roughly $1.8 million recent annual tax bill, according to the city’s Independent Budget Office. Real estate investment firm Madison Realty Capital has estimated that 10 million square feet of industrial space has been converted to hotels and other uses in the past decade. There is an old adage that real estate agents always expound “Follow the Art”, as artists make or break neighborhoods. Now the trend espoused is “follow Big Grocery Store Chains”. Williamsburg neighborhood acquired Key Food’s upscale Urban Market of Williamsburg on Broadway In 2013, Whole Foods on Bedford on July 26, 2016, and Trader Joe’s is coming as they recently signed a lease for 18,000 square feet from Madison Realty Capital who broke ground on the vacant lot site at 200 Kent Avenue. Williamsburg is also the land of Chocolate Michel Cluizel, who has the best chocolate cherries, Mast Chocolate, Fine and Raw Chocolate, Chocolate Wise, Chocolicious NY (Kosher), Cacao Market by MarieBelle on Guernsey St, Chocoholic Inc on Lorimer St. Williamsburg must have arrived. 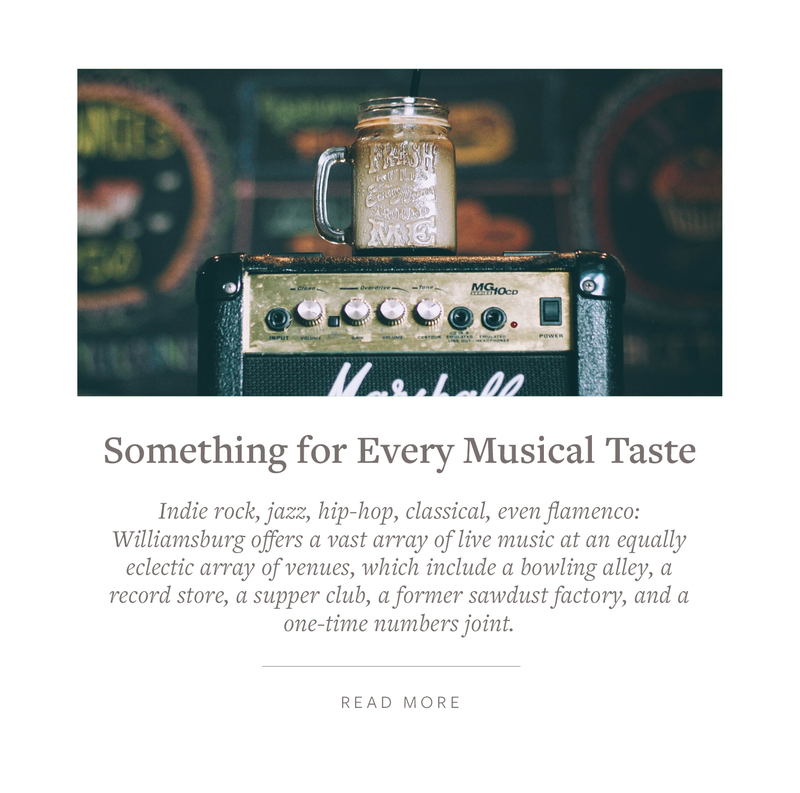 Take a walk-down the bustling Bedford Street it has its very own Apple retail store, high-end restaurants and gourmet shops abound: Davey’s Ice Cream, Bedford Cheese Shop, Uva Wines & Spirits, Café Beit and many more cool shops to find. 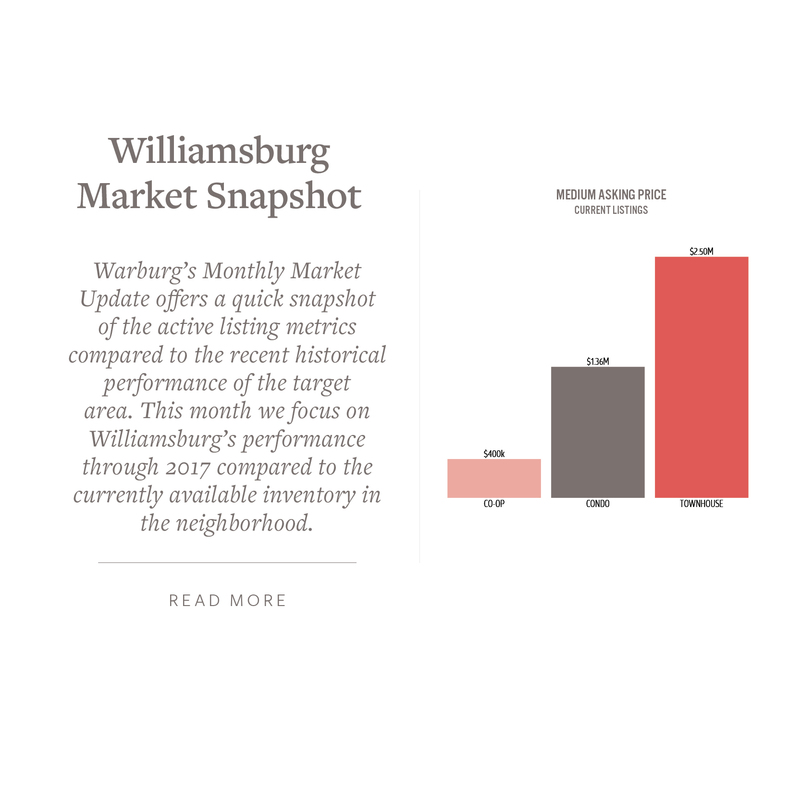 Williamsburg is thriving and the “L” train disruption is not bringing the area down thus real estate values should be increasing. Pete’s Candy Store opened in 1999 as a bar and performance space with a vast monthly line-up spanning many artistic mediums of expression: comedy, poetry, literary works, plays, musical performances, morbid story-telling, music and so much more. Brooklyn Bowl – High Tech Bowling Alley with Live Bands. And food too. Nitehawk Cinemas for an out of the ordinary movie going experience. New York’s first “cinema eatery,” this intimate three screen cinema combines two of the local obsessions with food and film. Serving gourmet concessions, handcrafted cocktails and full meals table side during your movie. The Rose Cinema at BAM (The Brooklyn Academy of Music) offers special screenings along with their other theater and music performances. Brooklyn Poets.org – Poetry for All: Celebrating History of Brooklyn Poetry of the past, today and tomorrow: Marianne Moore, W.H Auden, Walt Whitman, Hart Crane and many more all are part of Brooklyn’s spirit; the Birth place of American Poetry. Museum of Food and Drink (MoFad) Lab featuring edible & aromatic exhibits and education on food & drink..
Music Hall of Williamsburg Brooklyn for some live indie-rock bands. Black Ball Project – a one room art space started by artists who met as master’s students at Yale. Opening on March 14th —Anthony Graves and Carla Herrera-Prats ’ are exhibiting their artworks Their works in performance, video, sculpture, and photography think through the contradictions of contemporary labor and the myths of cultural production, bringing together collaborators from a variety of professions. AG Gallery – a new solo exhibition “FOLKLORE” by Maria V. Montiel opening on March 3rd, 2018. 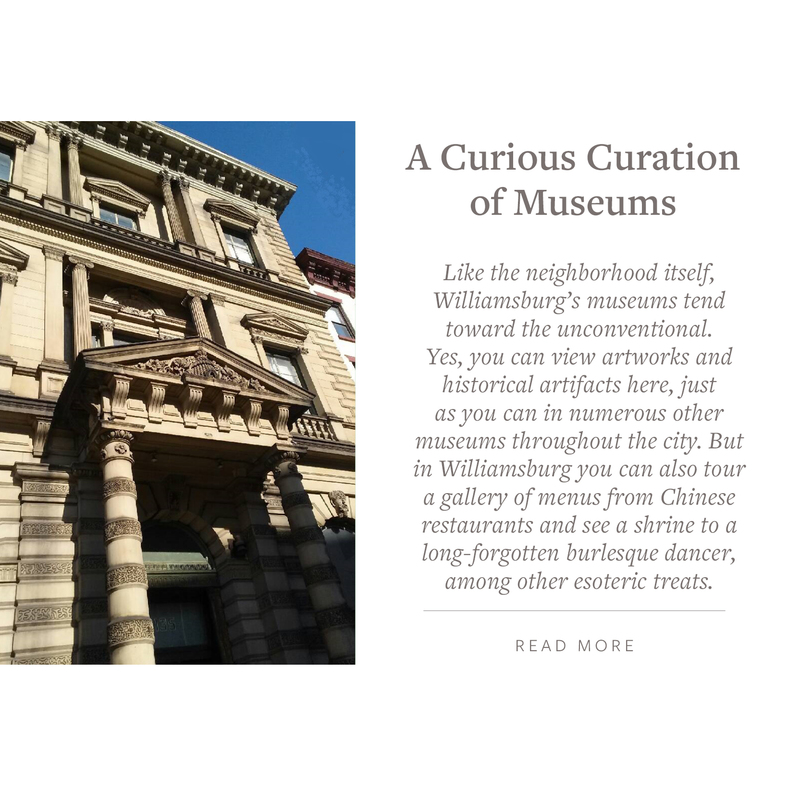 City Reliquary – New York City artifacts, rotating exhibits of community collections. There are so many great restaurants in the area: Barano for Southern Italian, Lilia for wood fired seafood, hand crafted pastas, Bamonte’s Circa-1900 neighborhood Italian restaurant plating red-sauce standards in a retro setting, a Pullman car Diner from the 20’s, the menu changes daily, Sunday In Brooklyn offering breakfast, brunch an dinner 7 days a week, La Superior for Mexican cuisine, Peter Lugers Steak House established in 1887, St. Anslem’s Steak House, Egg – the place to go for breakfast, Pies-N-Thighs or The Commodore when you need your fried chicken and biscuit fix, Allswell a rustic American pub that works closely with farmers and purveyors to source its food, Rosarito Fish Shack, a costal getaway with classic surf cocktails and transformative vibe, Reynard in the Wythe Hotel, The Four Horsemen a wine bar with small plates and music, Fornino for delicious pizza, Llama Inn for Peruvian classics, Japanese restaurant Okonomi / Yuji Ramen (closed on Wednesdays), Westlight and Leuca Southern Italian in the William Vale Hotel, Maison Premier was nominated for “2017 Bar of the Year Award”. Spring with its good weather is usually the busiest time in real estate so let me know if you or someone from your network would enjoy a Sunday Open House list for an area they are exploring or would like a neighborhood Market Report. I always enjoy hearing from you so send me a message let me know how you are doing.